The social media pages are filled with South African runners complaining about various aspects of our running society, but are they really the issue or are they the symptom of a much bigger concern and flaw in our sport? Sometimes these social media rants concern the ability to enter on line, or the early race closure, other times it’s the need to wear four numbers in a club race. In each case the social media fundi’s (yep everyone – me included), are experts and we try to sort the problem. But in truth we are dealing, and debating, the symptoms, not the problem. These, and many similar are minor problems and just the irritations of an outdated view and structure that was born of an era of amateurism. Technology, communication, and attitudes, have moved on, and the sport is opened to both commercialism and professionalism. Social media makes it so easy to complain and vent our emotion over a particular aspect and let’s face it for most people, it’s relatively easy to find a possible solution to that one particular issue. However, the trend to resolve individual issues, does not recognize the fact, that solving one aspect tends to simply cause, or negatively impact, on another area of the sport. The base problem is that we are dealing with a totally outdated and in administrable structure. Until that is reviewed, we are no more effective in solving the issues than the little Dutch Boy said to have blocked a hole in the dam with his finger. The trouble is that in this case there are now so many holes we have already run out of fingers. Let also appreciate that many of these ‘challenges’ are not the making of the individual personalities in the athletic administrative structures, but rather of the structure itself. Where the authorities are letting us down is in their apparent inability to recognize the bigger picture of where the cause of the problem lies. The structure of the sport, (and indeed many sports in South Africa), has so many flaws that we can no longer make ‘amendments’ to the principles, to accommodate the changes that have occurred in the past half century and not surprisingly it’s time to redesign, and evolve something that fits the social and technological environment of 2020 and beyond. Man was only just heading for the moon, computers with 64k of memory filled rooms, and two channels of TV was about to hit South African lounges for the first time when the current club structure was imported from UK. Apart from a small restructure, (but a bigger rewrite of the constitution), in 1992-94 to cater for unification, the essence of the structure has not changed. In the past two years, ASA have attempted to look at how to accommodate professional / commercial clubs into the system, by appointing a working group to investigate. However, the fit to the current structure is so bad that the working group has been extended for another period as the members struggle to find a means of marrying the two philosophies into the structure that commenced on a strict amateur basis where runners such as the famous Wally Hayward, and Ghost runner, John Tarrant, were barred from competition for accepting meagre money towards their international travel, and boxing respectively. The reliance on volunteers in monthly meetings can never be successful in a society where 47% of the population earn below the breadline salaries, and where text, chat, mail, and mobile phone demand instant response to questions, requests, and proposals. But that is exactly how we are currently trying to survive. There are even commission members and selectors who (infamously) insists that every item is only dealt with in the monthly meetings, and in doing so one member can paralyze every team selection and every commission decision. It’s an attitude that is not totally unique, but one that makes any progress in a modern society impossible. Current Pyramid structure: Leaders can’t see or hear the membership! The current structure is based on a pyramid, with representation the means of communication. From club level up to national, and every reducing number of representatives are appointed, tasked and authorized to speak on behalf of those who they represent. 200 club members, elect a chairman to take and fight for their views in a provincial landscape of say 200 clubs: these 200 club chairs elect a provincial president to represent 40,000 members at national level along with 18 other presidents: those 19 presidents elect a national president who is supposed to guide and look after the interests of the 120,000 registered athletes, coaches, officials and administrators – but sitting on the peak of the pyramid the President can’t see or hear the majority of those 120,000 members. Standing on the Peak, may give a panoramic view of the land surrounding the pyramid, but its severely restricts the view of the membership and the blocks that support it. 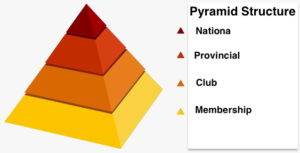 Administratively a President’s view is only of the 19 provincial presidents, and those on the outer surface of the pyramid. Those towards the top are totally removed from those on the ground. Indeed, it is a structure more akin to a dictatorship than a democracy. Secondly the design of structure means that it is the lowest who constantly need to maintain the integrity and solid foundation to maintain the peak in position. The whole weight of the pyramid is taken on those with the least potential, (some would say interest), and resources. Thirdly, the pyramid put the peak as far from the membership as possible, minimizing accountability, and hence interest from the masses. In their striving to get as high as possible people climb looking forward and abiding by the wishes of those they wish to replace, rather than fighting for those below. Such a structure, born out of a period of Monarchy, Colonialism, Dictatorship, and Czarism may have made sense in times when it was impossible and impractical to have direct contact and communication with each member. That is not the case today, in a time of Democracy and communication when its as easy, (and common), to have a web site with mass membership, and direct chat, mail, and message access. There is a reason the IAAF are restructuring under leadership of Seb Coe and that has the objective of a far greater athlete-centric focus. We too need to review our South African athletic structure, and where our focus lies. Make no mistake we have probably the best and most complete club structure of any country in the world, and it has served us well on many counts. We need the retain the benefits and strengths of the club structure, while changing the focus from the administration and support, to the sustainable production of participation and performance. In 2019 there is no reason that each member should not receive direct communication, and even be given voting rights direct to each level of the structure. We join a club, then a province, then only ASA, but membership is governed by ASA. It is ASA who provide, print (and sell rights for) the cloth license numbers, which are both a potential assistance and saving to each and every race organizer, but also a ‘membership card’ for each runner. Whereas in the past the documentation had to be completed on handwritten forms, there is absolutely no logical reason why both the province and the national office should not have a full data base of every member in the country, and their details: and hence a direct line of communication. Two things only prevent this: First the reliance on voluntary administration, which means many clubs, and many provinces are unable to handle the workload of managing the capture of this information on a yearly basis and all carefully timed to be at the one universal time that the nation is on holiday! That is not one generated by ASA, but rather one quietly based in commerce, by timing companies, and to some extent by commercial interests, who take millions, (yes millions) out of the sport and yet have absolutely no affiliation or payment into the sport! In fact, many of the timing companies use practices that break IAAF rules. In terms of a number, they need something to ‘hang their chips on’ so they can use technology, (not always accurate on the first read), to provide a result. It is the timing companies, or sponsors, (at least they pay into the sport to get something out), looking to gain brand advantage who have forced the use of additional race numbers. However, in typical fashion, as they lie low, the social media rebellion is against ASA for trying to devise a rule that modifies their current system to cater for the technological advance. If the system is restructured, then A) the number and license system can be streamlined into a single solution, B) All suppliers to the sport, (timing companies, event organizers, technical consultants, etc would require affiliating and be subjected to performance standards inline with competition and constitutional rules), C) Professionalism and Commercialization of the sport would be welcomed and integrated into the system. It is hoped that the above is sufficient to indicate a smattering of the challenges of the current structure and how I believe we are being enslaved by the current pyramid. 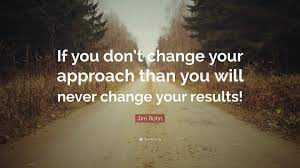 I have battled with this for quite some time: I know what we have doesn’t work, but what would I change? Over time the following proposed “model” has been evolved from what I see as obvious, but has been also shot down, modified, augmented and rebuilt by input and discussion, (and many bottles of wine), with people inside and outside the sport, here and overseas. THIS DOES NOT MAKE IT CORRECT – BUT it is something that I feel confident to present in the hope that something can be evolved that better serves the sport. It is necessary to re-emphasize what is being presented over the next few posts is an ATTEMPT to provide a POSSIBLE concept. It is NOT professed to be the ultimate, (or only) answer, but unless there is something put on the table, it becomes difficult for anyone to discuss or modify, or even scrap and provide an alternative. Let me also state that amongst the many discussions have been some with a couple of people on the ASA “working committee” and an outline submission was made to them last year. A key premise to the proposal is how it changes the focus to delivering “performance” (improvement) and makes room to accommodate both professional and elite goals, but also gives attention to the needs of those who wish to have the enjoyment, social interaction, and personal goal-breaking opportunities of mass participation. The proposal commences with the ‘Fruit’ of athletics, (the products), and then works backwards to define the support, the resources, and then only the administrative structure required to have the best possible harvest. This is the way any solution should be in my opinion. This is a dramatic turn around compared to the current Pyramid structure where the focus has been to put administration (including the constitution) in place before looking at how to develop the optimum product production. The new proposal recognizes that for commerce to ‘invest’ in the sport, it is essential that they are able to gain a return at least equal to, or greater, than their overall investment. They are also required to have confidence that the implementation of their agreement needs to be on a professional level, at least as capable as any alternative subcontracting agency or organization. Overall to maximize the benefit of commercial interest, and professional participation, it is essential for the organization to have clear objective, unquestionable integrity and credibility. Again, it’s no coincidence that the IAAF have initiated an Athlete Integrity Unit, and Ethics Committee. Without strict adherence to rules, without predictable, transparent and credible actions the sport would be poorly founded. Insisting on adherence to (the rigidity of) constitutions, the intent of rules, and the moral standards must cease to be something people are attacked, or expected to apologize for. These standard must be non-negotiable and an essential component, if the sport is to have fertile ground from which to grow. For sure that does not focus on administration! The first statement on the return of the 2017 World Athletics Championship athletes concerned South Africa’s 6 medals! A fortnight after the champs are over, most South African’s will be able to tell you the team came back with a 3rd place on the medal table, and perhaps even six medals, but the ‘man in the street’ will struggle to name all the medal winners, and even less those who just failed to make a podium, such as Lebogang Shange (4th ) or Akani Simbine (5th). When Team SA returned from Rio, the public knew about the 400m World Record and that the holder was South African. Usain Bolt and Mo Farah changed athletics first for their performances and then by their personalities! Performance is the ‘product’ that makes people aware of and sells the sport, and then the athlete becomes exposed, and marketable, due to his performance. If the athlete focuses on giving his best performance he or she earns the place he / she deserves in the competition. It’s the performance that counts, not what is on paper before the competition – that’s only a contributing factor. Performance is the FRUIT of nurturing: having the correct environment: the correct support: the correct resources in the correct conditions and with consistency. Like it or not mass engagement and protest have changed the world! Participation is the currency of both change and commercialism. Participation brings, coverage, awareness, attracts media, and brings commercial interest and potential. Athletics is the most natural of activities we were ‘Born to Run, Jump, and Throw’ – it is logical that a solution should take on a Natural format. When producers grow fruit, the end objective is to get the biggest, juiciest and best formed fruit possible. The focus is on the end product. Farmers cultivate a number of different fruits and each has its market, but the basic concepts are exactly the same be that berries, grapes, or say a Tomato. The Seed is the Performance. Wayde van Neikerk will, like Usain Bolt, Mo Farah, and Michael Johnson, retire from the sport, but just as the South African wanted to break Johnson’s record, so too there will be young runners, who have eaten the seeds of Wayde’s world record and are now growing in motivation to go even better. They are motivated by the performance (the statistics) and then only by the character and personality of the athlete. So the SEED (performance) is the key. The IAAF this year introduced medals for the coaches. If you have listened to my web site post by IAAF President, Seb Coe, it is clear that the mother body now fully recognize the essential relationships between coach and athlete and place that central to the production of the Performance. Anyone who has heard the medal winners, it is typical for the hierarchy of thanks to run as: God (whichever belief they subscribe to), coach, support and then family and friends. In most cases it is the coach who is captain of the ship, guiding the journey to the goal. Seb Coe was coached by his father, who is quoted as saying it was often harder to be the coach than it was a parent. Given this it is clear that the athlete and personal coach must be placed central to delivering the performance. 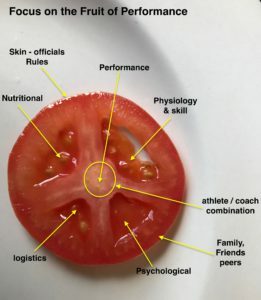 In virtually every sport the performance is achieved by working and development of four spheres: Physiological and Skill, Psychological, Nutritional, and Logistical. The athlete / coach are supported by specialists in each field. These (in the tomato) are the arms working outwards, with the ability in each of the four chambers determining not only the shape, but also the overall size of the tomato. Medics, biokineticist, psychologists, physiotherapists, skill trainers, and a host of others are employed in the hope of producing the biggest, best and most rounded and beautiful fruit. The agents and managers are often the driver of the non-competitive logistics. Outside this is the ring of support which can be likened to the family, friend and external support. This not only provides the internal support, ring-fences and protects from external attack or distractions. The skin is the rules, standard, and ethics of the sport. Break the skin and the fruit is fraught, the performance (seed) is lost. The Technical Officials contribute to the strength of that skin. Poor officiating means weak skin, and questionable quality of the performance. As a sport we want as many healthy well rounded and bulky, sweet and ripe fruit as we can. These are the fruit that become the attention grabbers in the public whether or not they were in or out of the market. Who hasn’t been ‘convinced’ to buy an apple, or strawberry simply because it looked so good? That is how we want the public, media and commerce to view and buy into athletics: it must look irresistible! No fruit can grow on its own. Once plucked from the tree, it’s existence is limited and while it may continue to ripen for a short time, its health is a downward trend. That is as it should be with the structure of the sport: The tree is the vehicle by which the seed is taken and nurtured to its optimum ripened state. ASA can be considered to be the trunk, with the 19 provinces the major branches, the clubs are the minor branches off the provincial limbs, the twigs the coaching groups and squads. Some provinces have, or should have, regional sub branches, and some limbs have more branches and twigs than others. It is the efficiency, support and nutrition of the trunk that determines how well each substructure grows. The trunk itself may be branched into disciplines: Track and Field and then Running, (as the IAAF are proposing), which covers road, XC, ultra, mountain, trail, and all other forms of running activities. It is the trunk that supplies the stability, and the sustenance in terms of sap fed to each and every limb and twig, feeding the development of fruit. The trunk has a sole purpose of nurture and supply, it does not get involved in fruit production. However, if the trunk dies, or the flow of the sap is restricted the harvest is poor. 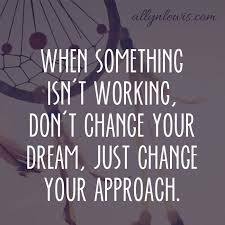 If a limb dies there is no fruit from those branches and twigs. Importantly, the only way to revitalize a dead or dying portion of the truck, limb, or branch is to prune it back, cut out the dead wood, and initiate new growth and development to bring a new stronger harvest. The trunk is not above, everything else, but it is integral to everything else and works in the background hidden by the leaves and the fruit. Is that not how we would want the administration to work. Clearly the system is logical, natural, and applicable to what we want to achieve – a bountiful harvest of performances! But neither the trunk, the branches, nor the fruit can grow without the energy of Sunlight, Oxygen and water. This is where participation is vital to the existence of the tree. The food of life comes from the Sun, Oxygen and Water in the environment, but it is the participation of LEAVES that convert this is to the energy and food to allow growth. The leaves provide the sustainability, but also require the trunk and branch structure for their own life. The leaves are the covering and most obvious part of the tree, and are more sustainable than the fruit. They also protect the fruit. The healthier the leave structure the better and the larger the fruit grows. The leaves contribute to the success of the fruit harvest, but the leaves are normally the first recognition of a healthy tree. So too in athletics, it is the participants who need to make a contribution to sustain and provide the nutrition for the fruit to grow. It all works in unison: no one part of the tree can grow or produce the seeds for the future without the other. Each segment has a part to play, and none is more important than the other –but the ‘wealth’ of each is reliant on each part doing its work to the greatest efficiency. There is no Lord and Master – there is only an understanding that the tallest, the most productive and the most obvious tree is the one that has the most efficient and hardworking system of leaves, twigs, branches, limbs and trunk. There is no Dictator, Czar or top dog… The trunk is a conduit for resources and stability: However the truck is totally transparent in its direction and growth when put under closer inspection – again something we seek in our sport. Furthermore, the taller the tree grows the greater the requirement for the integrity of a solid far reaching root network as a foundation. No segment of a tree can rest or fail without it destroying the other parts of the tree, so too in athletics: failure by administration, failure by officials, members who take but don’t participate, coaches who don’t grow, and elite who expect to achieve and receive, without putting in effort, all contribute to the death or unsustainable sport. Root Integrity Determines The Peak. A tall tree cannot exist with a weak root structure: The roots network is based in solid ground and grows with the trunk which is in-turn fed by the photosynthesis of the leaves. 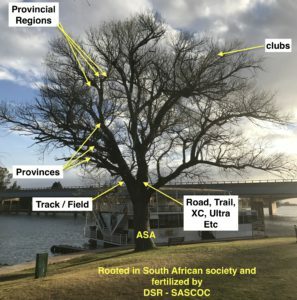 Athletics grasp and founding in South African society can only be as good as the root network, which is reliant on the number and operation of healthy leaves. It is the energy from the leaves that feeds and determines the trunk growth, but it is the roots that provide the initial resources for the leaves to flourish. Without integrity in the roots, the tree would bend and fold in the wind, or under perform. In athletic terms the roots seek out the most fertile ground in the South African soil. Based on adherence to moral and ethical standards, IAAF Rules, transparency, and credibility the roots of the sport can edge and grow further and wider into South African society. So there is my proposed structure for our sport (and could apply to many sports). These are the principles of the change of approach, and mindset. •	Communication throughout the membership. •	Participation can be grown and recognized and assisted to achieve their desires, whether social or self-growth or improvement. •	That the sport becomes sustainable. Although this, by nature of the subject, has had to be long and explanatory, it is hoped that this makes some logic. It is open to criticism and suggestion for modification. Hopefully, it can be seen that the natural and living embolism of a tree, is more appropriate to what needs to be achieved than the dormant man-made structure of a pyramid. Future posts can now be shorter – Phew!!! !